Indonesia TODAY presents the latest and complete news in Indonesia, covering national, political, economic, law, property news. Tiring election techniques must be evaluated - The technical implementation of the current election makes the officers in the field exhausted. 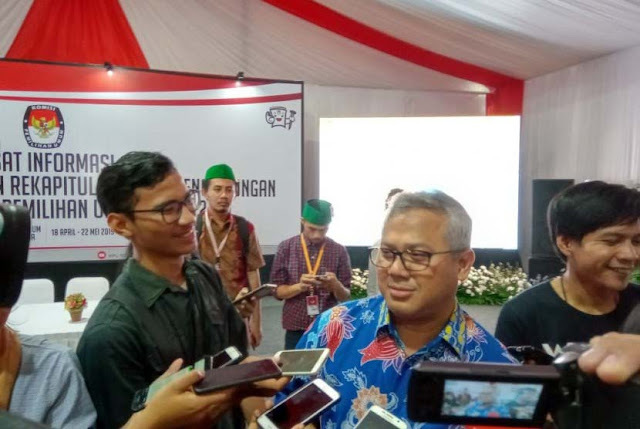 Chairman of the KPU, Arief Budiman, gave a statement to reporters at the Vote Counting Information Center, Menteng, Central Jakarta, Saturday (20/4). Chairperson of the General Election Commission (KPU), Arief Budiman, said that the technical implementation of the election must be evaluated. The technical implementation of the current election makes the officers in the field exhausted. "This is all our concern after the election. We need to evaluate not only the system but also the technical work. How about the technical work like now people (officers in the field) cannot finish until midnight. He even has to continue until morning until the next sunrise, "Arief said to reporters at the KPU Office, Menteng, Central Jakarta, Wednesday (24/4). In other words, the polling group organizer (KPPS) officers working from sunrise to sunrise were not finished. "It's tiring, it's tiring for all. For election organizers, for election participants, for security officers, for the people too. So I think it needs to be a joint discussion," said Arief. Arief added, the total number of KPPS in charge during the 2019 Election was around 7.2 million people. At present, even more than 100 KPPS people have died due to exhaustion while on duty. "I checked that even the number of those who died increased," Arief added. 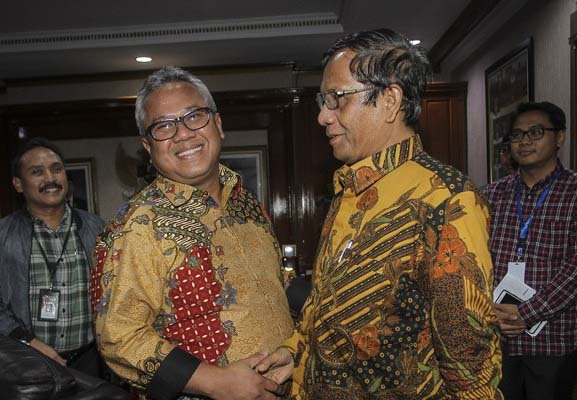 Commissioner of the General Election Commission (KPU), Viryan, said that simultaneous elections as carried out in 2019 were enough to be done once. The simultaneous 2019 election proved to exceed the capacity of the organizers. "There are enough concurrent elections like this. The election simultaneously in the context of this presidential government system is good. However, the simultaneous use of five ballot boxes or five electoral groups has proven to exceed our capacity to create simultaneous and effective elections with integrity and peace, "Viryan said when met at the KPU Office, Menteng, Central Jakarta, Tuesday (23/4). Therefore, in the future KPU proposes that elections be grouped into two, namely national elections and local elections. National elections with a group of presidential and vice-presidential elections, the Indonesian Parliament and the DPD. "Why are these three disrupted, because this is the political institution at the national level, namely the executive in this case the president and vice president, the legislature is known as the DPR and DPD. So it is fitting to be done nationally," he continued. Second, local elections to elect regional level officials. According to Viryan, local elections can be divided into two. "This local election is actually two choices. That is combined with the selection of provincial DPRD, regency / city DPRD, governors, mayors and regents at the same time. Or, disaggregated for elections at the provincial level and elections at the district / city level," he explained. Even so, Viryan assessed that the proposal needed an in-depth study. "But at least as a prefix to look ahead, of course, is worth considering," he said. Ballot burning video spreaders can be convicted - A viral video burning of election logistics in Papua. 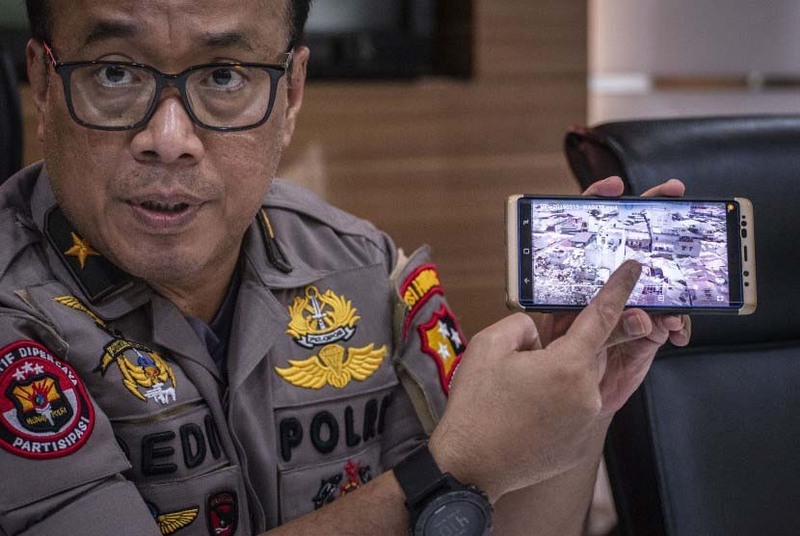 Karopenmas Police Public Relations Division Pol Brigadier General Dedi Prasetyo shows the location of the case of a bomb explosion in Sibolga, at the National Police Headquarters, Jakarta, Wednesday (03/13/2019). Police Headquarters confirmed the authenticity of the video about the burning of the box and ballot papers for the 2019 election that took place in Puncak Jaya, Papua. The National Police will investigate the video spreader account about the incidents of box burning and ballots. Indonesian Police Headquarters spokesman Brigadier General Dedi Prasetyo said the video spreader had the potential to violate the ITE Law which was considered to be lying and provoking. "It (the video spreader) can be snared by the ITE Law to account holders who spread hoax news and who do not fit the facts," Dedi told reporters at the National Police Headquarters, Jakarta, Wednesday (24/4). Dedi explained, the National Police Headquarters got a report from the Special Criminal Investigation Directorate of the Regional Police (Polda) in Papua about the burning of boxes and ballots in Puncak Jaya, Papua, on Wednesday (24/4). The report is indeed the same as the action video of a similar incident that was spread by accounts on social media. But it was different, said Dedi, a report from the Papua Regional Police, regarding the burning of boxes and ballots as an action to destroy the remaining unused election logistics. According to Dedi, the remainder of the logistics was deliberately destroyed because it was not desirable to be a tool for misuse of electoral fraud. Whereas the narrative in the video on social media, the burning action was a deliberate action from the disappointed attitude of voters who could not use their voting rights in the 2019 Presidential Election. The voters only get 2019 Pileg ballots, and cannot vote to elect the presidential / vice presidential candidate. But said Dedi, the narrative, as a lie. Dedi explained, in Papua, a number of electoral districts use special systems. There are 12 regency-level regions that use their voting rights by means of noken. One of them is in Puncak Jaya. The noken system is a voting pattern that makes traditional elders or people appointed to represent their voters in one place, to vote. This noken system is indeed considered legitimate, especially in the Papua region. Therefore, said Dedi, the narratives in the video are scattered, untrue and potentially criminal because of spreading lies. "From the results of the deepening of the Special Criminal Director, he will investigate the accounts that disseminate information (burning)," continued Dedi. Contacted separately, the Chairperson of the Papua Regional Election Commission (KPUD), Theodorus Kossay, confirmed the incident of burning boxes and ballots in the Puncak Jaya. He told Republika on Wednesday (24/4) that the arson occurred on Tuesday (23/4). He said, the election logistics were burned, not the remaining ballots of the elections that had been held April 17. But the valid ballots that have been used and punched. "Because it violates the law. Because right now we are still doing recapitulation, "Theodorus said when contacted from Jakarta on Wednesday (4/24). He promised to investigate the arson. Because according to him, the burning of ballots was illegal. "Because it is still a state-owned document," he continued. Recapitulation of the results of national level elections starting tomorrow - The national level recapitulation process depends on the speed at the lower level. The 2019 General Election Committee (Election) carried out a recapitulation of the vote at the sub-district level before witnesses from political parties in Ulee Kareng, Banda Aceh, Aceh, Tuesday (4/23/2019) night. 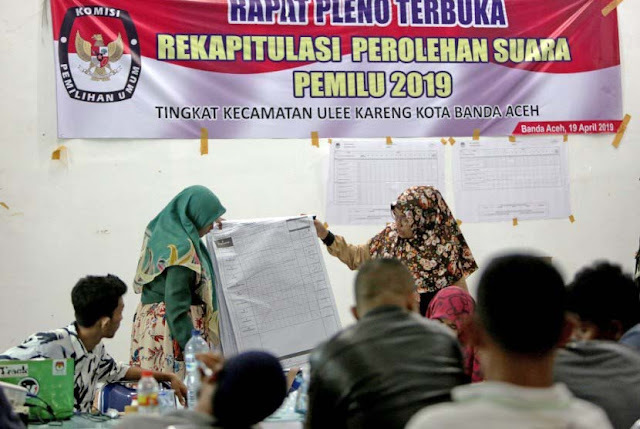 Chairperson of the General Election Commission (KPU), Arief Budiman, said that his party opened the recapitulation of the results of national-level voting starting Thursday (25/4). National level vote recapitulation will continue until May 22. "Yes, indeed we schedule starting tomorrow the recapitulation of the results of the national level elections," Arief said to reporters at the KPU Office, Menteng, Central Jakarta, Wednesday (24/4). However, he explained that the national vote recapitulation process was highly dependent on the speed of recapitulation at the provincial and district / city levels. KPU has asked its staff in the regions to report if they have completed the recapitulation process. The KPU itself gave a deadline for vote recapitulation at the District level for 17 days from the vote. Then the recapitulation will be continued to the district / city level before being forwarded to the Provincial level. "For example, the provincial friends today have finished recapitating, and let us know, if the recap is finished tomorrow to Jakarta, we will open it, but we have prepared it starting tomorrow," Arief said. However, Arief said the KPU would not wait for the recapitulation process in the regions to be completed. The national level recapitulation process is carried out simultaneously. "If you wait for it to finish, everything will be too late, so who is done, we can recap it first, so we run it smilutan," he said. As is known, the elected election participants in the 2019 Election will be determined based on the results of the vote counting recapitulation from the C1 Plano form which is done manually and in stages, starting from the polling station, sub-district, district / city, provincial and national levels. The results will only be announced by the KPU no later than May 22, 2019. Prabowo declaration three times, not confident - TKN considered the declaration repeatedly showing insecurity. 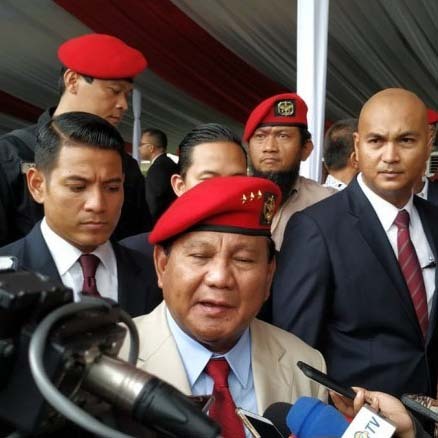 Prabowo Subianto's number 02 presidential candidate again held a declaration of victory at the TMII Pencak Silat Padepokan Building, East Jakarta, on Wednesday (24/4). Responding to this, the National Campaign Team (TKN) Joko Widodo-Ma'ruf Amin said that this was a sign of the lack of confidence in his political opponents. "Quite enough (declaration of victory), so if many times it shows precisely the self-confidence," said TKN spokesman Usman Kansong at Cemara Post, Menteng, Central Jakarta, Wednesday (24/4). Usman said, TKN only held a declaration of victory once, because they were confident. Moreover, in a quick count or quick count from a number of survey institutions, it shows that the candidate pair number 01 is superior. "We are pretty good, we declare Pak Moeldoko in this room (Cemara Command Post), that is quite enough and does not happen again today," Usman said. He added, his declaration of victory was an initiative of TKN. Meanwhile, Jokowi-Ma'ruf Amin candidate chose to wait for an official decision from the KPU. "We who declare are campaign teams not our presidential or vice presidential candidates. We have enough confidence in the campaign team," Usman said. It should be noted, the stronghold of 02 again held a celebration of the victory claims at Padepokan Pencak Silat TMII, East Jakarta. A number of figures were also present, such as Chairman of the National Winning Body (BPN) Djoko Santoso and senior politician of the National Mandate Party (PAN) Amien Rais. A few days earlier, presidential candidate Prabowo Subianto also claimed victory in the residence of Kertanegara, South Jakarta, after the election. Prabowo had prostrated thanks with his one-sided victory. The next day, Prabowo accompanied by Sandiaga Uno again claimed a victory of 62 percent. This claim is based on the results of the real count conducted by the internal BPN. There was no systematic fraud in the KPU data entry - The number of polling stations that have been entered into power reaches 241,366 polling stations. Chairperson of the General Election Commission (KPU) Arief Budiman (second left) welcomed the arrival of former chairman of the Constitutional Court (MK) Mahfud MD (second right) at the KPU office, Jakarta, Wednesday (24/4). Former chairman of the Constitutional Court (MK) Mahfud MD said that fraud in a structured manner by the KPU when data entry on election results was not possible in a structured manner. Because the error in the entry of the data is not massive. Mahfud and a number of figures visited the KPU Office on Wednesday (4/24) afternoon. His arrival was to check the election results data entry system. According to him, until 17.15 WIB, the number of polling stations that had been entered into power reached 241,366 polling stations. Then, data entry errors occurred 101 times since the first time until now. Of the 101 events, 24 of which were reports from the public. Meanwhile, the rest is the KPU's own findings. "The findings were corrected on their own because they were found alone, which the community did not know the truth. From there, this mistake meant there were only 0,0004 percent. That means there were 1: 2,500 polling stations. So it would be impossible if there was structured engineering. percent, "Mahfud told reporters at the KPU office in Menteng, Central Jakarta, Wednesday night. He also stressed that there was no possibility of incorrect data entry into the Situng KPU intentionally. He also revealed that data entry errors were not just targeting a candidate-vice presidential candidate pair. '' Not only happens to win a candidate pair. "Two candidate pairs both got the advantages and disadvantages of some of the mistakes in the entry, so it was impossible to be structured," he said. Then, Mahfud also revealed that the KPU server was in the country. All the people who operate the IT are also native Indonesians. "The people are also all Indonesians, there is no foreign one. Because of that, the public must be calm, do not let this election be damaged by hoaxes," he said. However, if there are still parties who do not believe in the KPU's performance, there is still a legal forum. According to Mahfud, there are two legal forums that can be followed. First, the law in the sense of implementing the regulations proven by the KPU on May 22 when the national election results were stipulated. Mahfud said, all parties were allowed to present data. "If you still don't believe, a legal forum in the sense of a dispute is still in the Constitutional Court. So all people should be calm, and certainly have to supervise. We do not consider the error to be justified, but it must be understood and it can be resolved in May 22. So, do not act individually and continue to spread hoax as if there is engineering, "Mahfud said. The BPN chairman said Prabowo should win 70-80 percent - BPN claims the Prabowo-Sandi pair was cheated in the 2019 Presidential Election. The National Winning Body (BPN) Prabowo Subianto-Sandiaga Salahudin Uno claimed the victory of the pair number 02 could win a landslide victory in the 2019 presidential election over the partner pair 02 Joko Widodo (Jokowi) -KH Maruf Amin. BPN Chairman Djokoso Santoso said that the landslide victory could reach 70-80 compared to 30-20 percent. But Djoko said, the number of landslides was deliberately rigged. "Even though we were cheated (Prabowo-Sandiaga) still won. If not rigged it can reach 70 percent, 80 percent, "Djoko said in the TMII area, East Jakarta (East Jakarta), Wednesday (24/4). But he said, even though it was rigged, the results of BPN's internal calculations, still put Prabowo-Sandiaga at 62 percent. "That's 62 percent, the rest of the votes that say Prabowo-Sandiaga won," continued Djoko. Djoko, who was once the TNI Commander, considered that cheating against Prabowo-Sandiaga during the 2019 presidential election was brutal on all fronts. "This cheating on Prabowo-Sandi is out of date. "They do it in a planned, massive, and systematic way," he continued. Even cheating against Prabowo-Sandiaga, Djoko's claims still occur today. According to him, if on the day of the April 17 voting the form of fraud occurred in polling stations (TPS), at this time, this form of fraud occurred during the calculation. Djoko claimed, many reports mentioning the vote recapitulation process of the polling stations in C1 published by the KPU benefited the candidate pair 01. Namely, in the form of inflating the vote 01, and reducing legitimate electability to 02. Therefore, Djoko requested that all volunteers and Prabowo's supporters -Sandi, keep working hard guarding the voice of victory 02. Prabowo-Sandiaga's victory claim has been officially announced more than four times. But the 70 to 80 percent victory claim is a new figure that the BPN is talking about 02. However, the claim of the victory of the Prabowo-Sandiaga camp is the opposite of the temporary C1 calculation version of the General Election Commission (KPU). The KPU Voice Counting System (Situng) page until Wednesday (24/4) at 19:30, still puts Prabowo-Sandiaga with 44.19 percent of the vote. These results make the Jokowi-Maruf candidate win with 55.81 percent. Situng KPU is the official publication of form C1 which is the recapitulation data on the results of voting, in polling stations throughout Indonesia. The current percentage of the Situng KPU version has reached 30 percent, or the C-1 recapitulation result of 244,576 polling stations. KPU, in the 2019 Election, established 813,350 polling stations throughout Indonesia, and electoral regions abroad. The Situng KPU number is currently in line with the quick count version of many survey institutions on April 17. That is a prediction about Prabowo-Sandiaga's defeat at 44-45 percent, and Jokowi-Maruf's advantage with a 54-55 percent victory. However, the Situng KPU number is not official and is not a reference for the victory of one candidate candidate. Nor is it a reference for election organizers to determine the official results of the presidential election. Because, the KPU will calculate the vote manually from all C1 until the coming month. On May 22, the KPU will announce the official vote count results of the 2019 Presidential Election, as well as determine the winner. Need Evaluation from 2019 Election - Evaluation of 2019 Election so that no more victims. Sultan Sepuh XIV, PRA Arief Natadiningrat distributed his voice at polling station 4 in Ward of the Kasepuhan Palace, Cirebon City, Wednesday (6/27). In the simultaneous local election this time, residents of Cirebon City followed the Cirebon Pilwalkot and the West Java Pilgub. 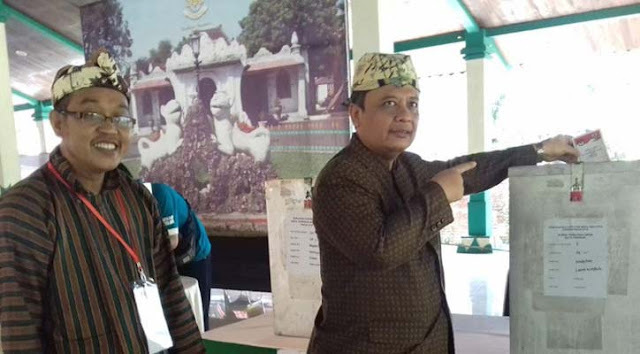 Sultan Sepuh XIV Kasepuhan Palace Cirebon, West Java, PRA Arief Natadiningrat, said the 2019 General Election was very heartbreaking, because many casualties fell due to fatigue and this needed to be evaluated again by the democratic system. 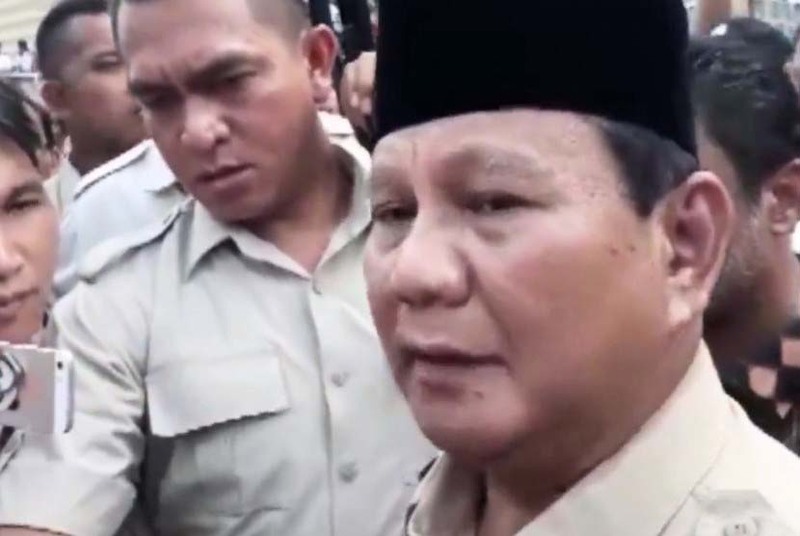 "This 2019 election is a heartbreaking election because many officers have died as a result of fatigue," Sultan Arief said in Cirebon on Wednesday when asked about the number of officers killed. According to Sultan, with the many officers who died in the 2019 General Election, there needs to be a large evaluation from the government, because this concerns people's lives. He said, even though the election was a people's party which should have been encouraging, it was not a grief because the organizers were not ready. "Our democratic system must be fundamentally evaluated again, because it is very expensive and drains large costs both from the government and candidate side," he said, who is also the General Chairperson of the Keraton Silaturahmi Forum throughout the archipelago. He also appealed to avoid further casualties, election organizers must pay attention to vitamin intake and adequate accommodation for election officials. "We offer condolences to the deceased election officers who wished to be martyred," said the Sultan. © Copyright 2015 INAToday. Designed by Bloggertheme9. Powered by Blogger.